New Orleans, La. 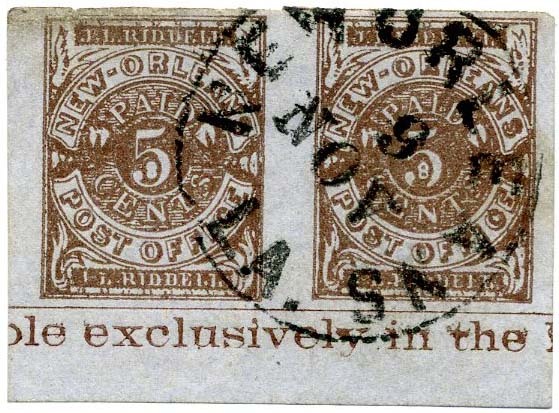 5¢ brown on white #62X3, 4-margin copy used with town cancel, Fine, 2013 SCV $200. $130. New Orleans, La. 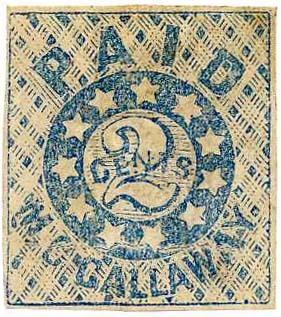 2¢ brown on bluish #62X4 pair tied on piece of blue cover by double strike of straightline PAID as well as neat Aug 27 town cancel, 2013 SCV $475. $350. 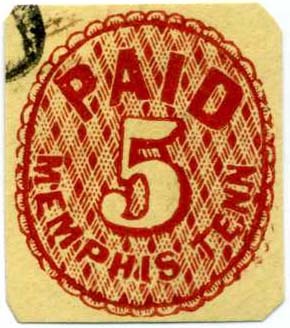 Memphis, Tenn 5¢ red #56X2 cut to shape and used with town cancel $150. New Orleans, La. 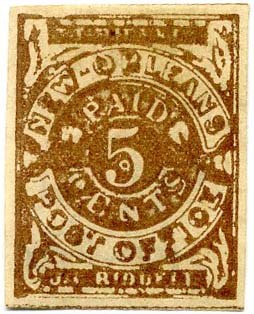 5¢ yellow brown #62X5, traces original gum, heavy hinge remnant $110. New Orleans, La. 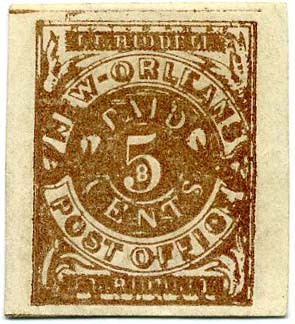 5¢ brown #62X3, used, edges slightly gum stained, 2013 SCV $200. $100. New Orleans, La. 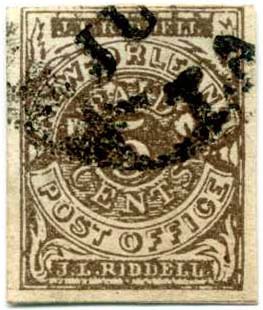 5¢ brown #62X3, used with town cancel, small corner crease at top otherwise Very Fine, 1998 P.F. Certificate #0325248 $200. New Orleans, La. 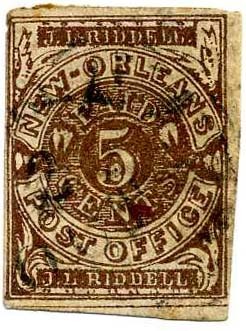 5¢ yellow brown #62X5, unused, no gum, Fine, 2013 SCV $160. New Orleans, La. 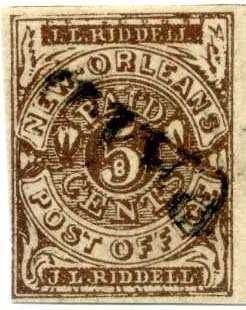 5¢ brown #62X3, used with straightline PAID cancel, Fine-Very Fine, 2013 SCV $200. $160. New Orleans, La. 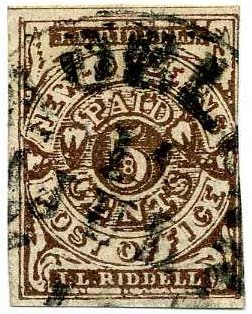 5¢ brown #62X3, used with straightline PAID cancel, Fine-Very Fine, 2013 SCV $200. $150. New Orleans, La. 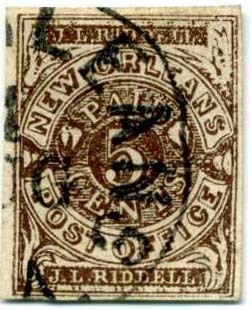 5¢ brown #62X3, used with nice town cancel, Fine-Very Fine, 2013 SCV $200. $150. New Orleans, La. 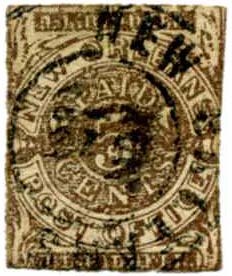 5¢ brown #62X3, used with neat town cancel, Very Fine, 2013 SCV $200. $220. New Orleans, La. 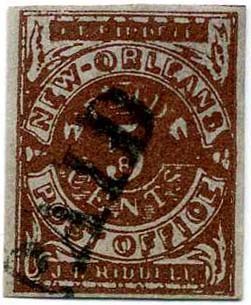 5¢ red brown #62X3 variety, used with town cancel, a most unusual shade with a lot of red in it compared to the usual brown shade, not cataloged thus, trace of thinning at top. $500. New Orleans, La. 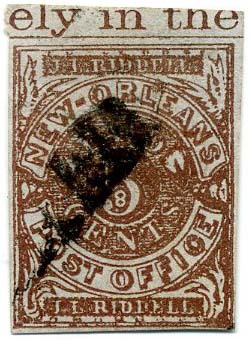 5¢ brown #62X3, used with nice town cancel, 2013 SCV $200. $150. New Orleans, La. 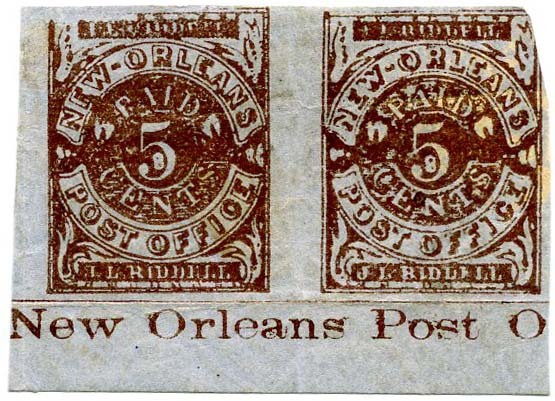 5¢ brown #62X3, wide borders, used with town cancel, pressed vertical crease in left margin, 2013 SCV $200. $180. New Orleans, La. 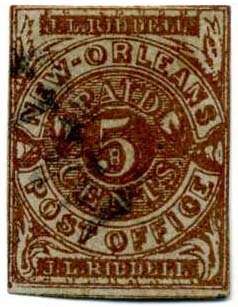 5¢ red brown on bluish #62X4, used, wide margins, used with postmaster provisional handstamp applied at the riverfront station, Very desirable use. $325. New Orleans, La. 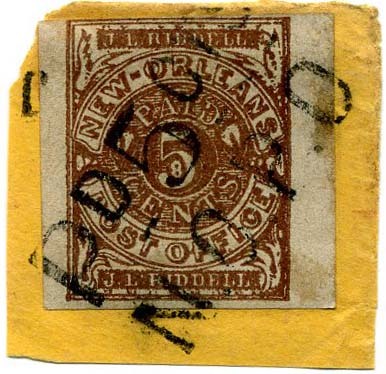 5¢ yellow brown #62X5, used, small thin, nice margins, SCV $250. $140. New Orleans, La. 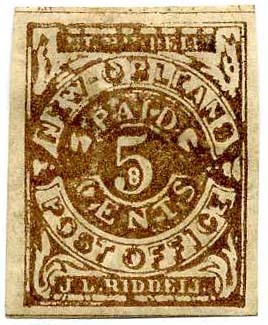 5¢ yellow brown #62X5, used, showing part of imprint at top, three nice margins, 2013 SCV $200. $375. New Orleans, La. 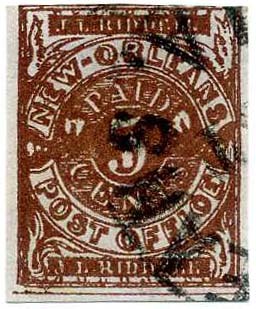 5¢ red brown on bluish #62X4, used with straightline PAID cancel, SCV $200. $110. New Orleans, La. 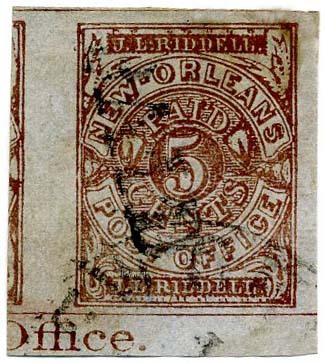 5¢ red brown on bluish #62X4 (3 margins) used with straightline New Orleans PAI[D] cancel, 2013 SCV $200. $150. New Orleans, La. 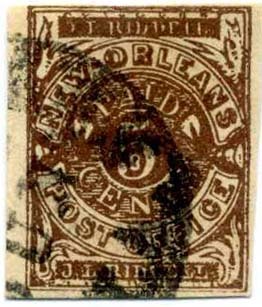 5¢ red brown #62X3, used with town cancel, a most unusual shade with a lot of red in it compared to the usual brown shade; not cataloged nor certified thus (just says "shade of brown", trace of thinning at top. 2011 PF certificate. $500. New Orleans, La. 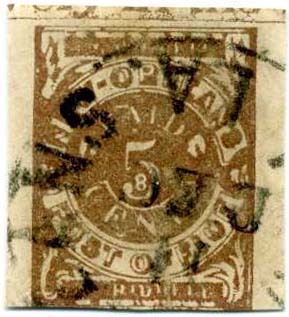 5¢ yellow brown #62X5, no gum, small thin at center otherwise Fine, 2013 SCV $160. $140. New Orleans, La. 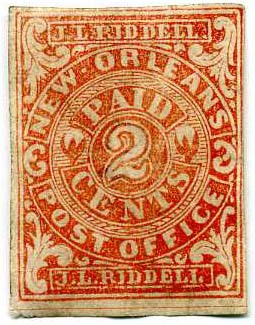 2¢ red #62X2, used with neat town cancel dated February , 2012 CSA Certificate #05720; 2013 SCV $1,000.CCV $1,500., Scarce used. $750. New Orleans, La. 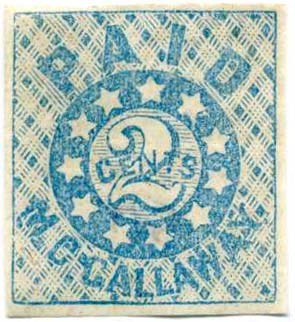 5¢ brown on bluish #62X4, used, 2013 SCV $200. $150. New Orleans, La. 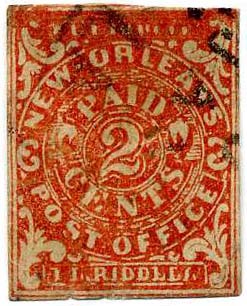 2¢ red #62X2, no gum, fresh, bright, 2013 SCV $190. $150. New Orleans, La. 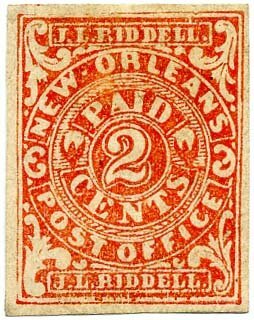 2¢ red #62X2, unused, no gum, 4 even margins, faint purple backstamp, 2013 SCV $190. $170. Memphis, Tenn. 5¢ red #56XU2 cut square, used, 2005 PSE Certificate, 2012 SCV $3,000 as entire. $800. 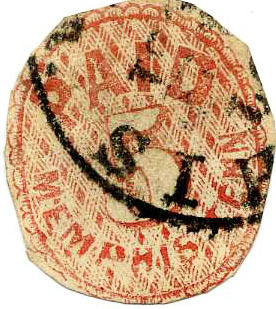 Memphis, Tenn. 5¢ red #56X2, used with light town cancell, 2012 SCV $250. $200. 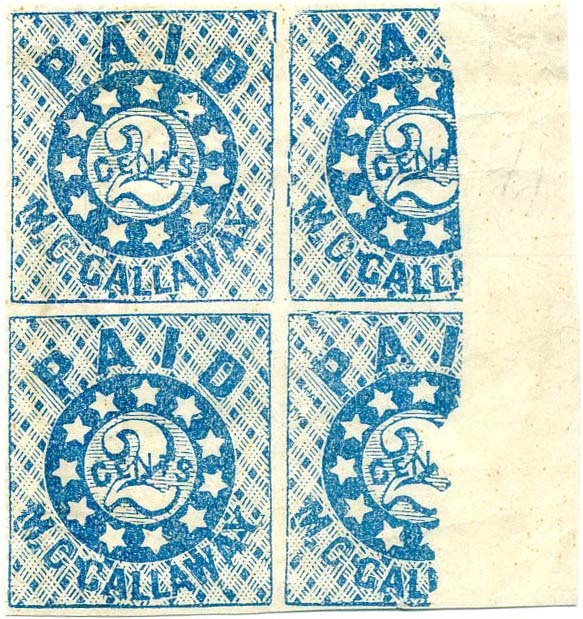 Memphis, Tenn. 2¢ blue CSA Catalog #MEM-TN-A01a (SC #56X1) block of four with the top pair the CRACKED PLATE VARIETY, Positions 16 & 17, bottom pair with pressed creases, no gum. Lovely position piece, CCV $1,300+.. $1,200. 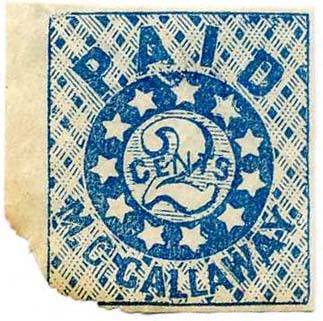 Memphis, Tenn. 2¢ blue #56X1, no gum, faint crease, fresh, CCV $150. $150. 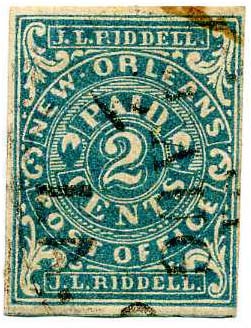 Memphis, Tenn. 2¢ blue #56X1 right sheet margin single, no gum, faint creasing, CCV $150. $200. 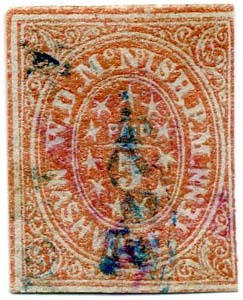 Memphis, Tenn. 2¢ blue provisional MEM-TN-A01 (SC 56X1) left sheet margin, position 6, no gum, CCV $150. $80. 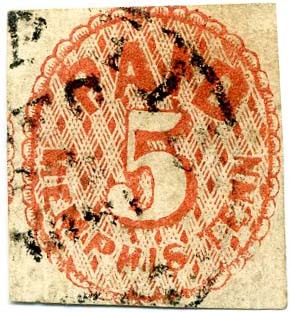 Memphis, Tenn 2¢ blue provisional MEM-TN-A01 (SC 56X1), position 7, no gum, CCV $150. $120. 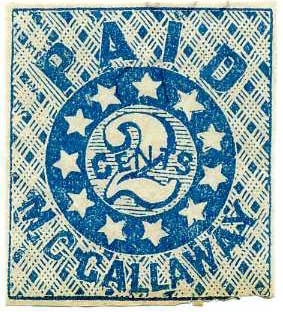 Memphis, Tenn 2¢ blue provisional MEM-TN-A01 (SC 56X1), position 8, no gum, bit rumpled at bottom, CCV $150. $110. New Orleans, La. 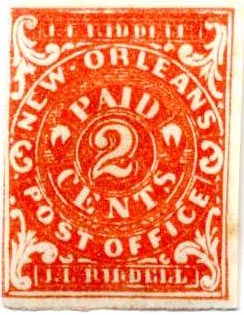 2¢ red #62X2, unused, no gum, small corner edge thin at lower left (could be trimmed off) and a bit soiled, 2013 SCV $190. $100. New Orleans, La. 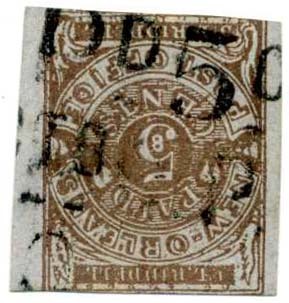 5¢ brown on bluish #62X4 with part of imprint at top, used with town cancel, slight creasing and bit of edge thinning otherwise Very Fine, SCV $200. $180. New Orleans, La. 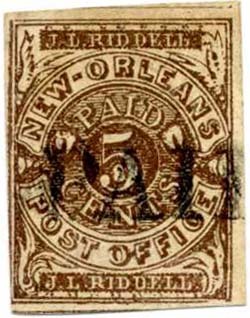 5¢ brown #62X3, used, Fine, SCV $200. $150. New Orleans, La. 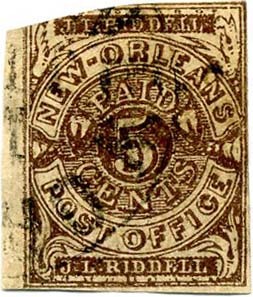 5¢ yellow brown #62X5, traces of original gum, heavy hinge remnant, Very Fine, SCV $160. $160. New Orleans, La. 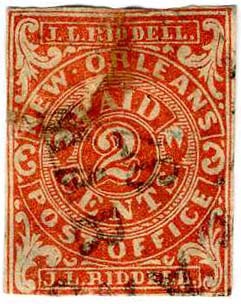 2¢ red #62X2 used with light town cancel, faulty spacefiller with upper left corner torn off and replaced, 2013 SCV $1,000, CCV $1,500. $400. New Orleans, La. 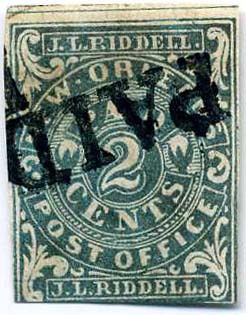 2¢ blue #62X1 used with light town cancel, slight stain at upper right and small tear at upper left otherwise Very Fine, 2013 SCV $550, CCV $750. $450. New Orleans, La. 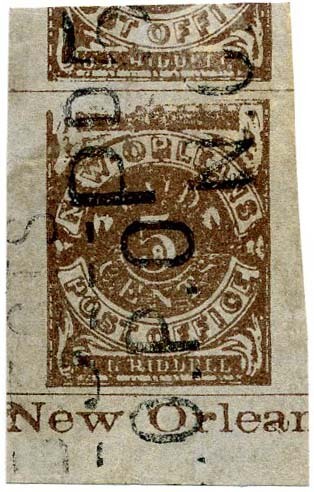 5¢ brown, Scott 62X3, used with neat town postmark, fresh, SCV $200. $150. New Orleans, La. 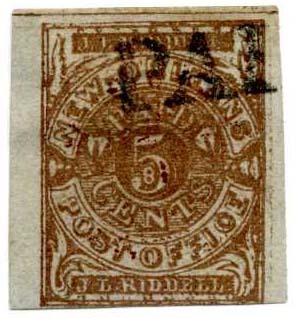 5¢ reddish brown on bluish, Scott 62X4, used with neat straightline PAID, wonderful deep rich color, small thin, SCV $200. $150. 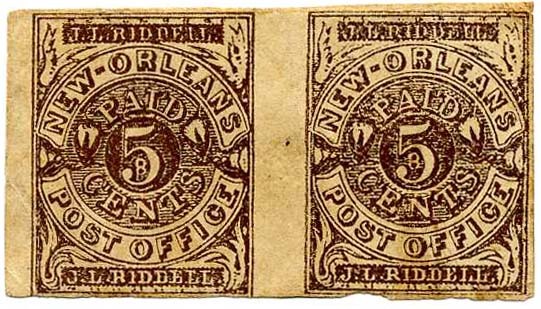 New Orleans, La.5¢ brown pair, Scott 62X3, unused, original gum, small faults, SCV $800. $350. Memphis,Tenn. 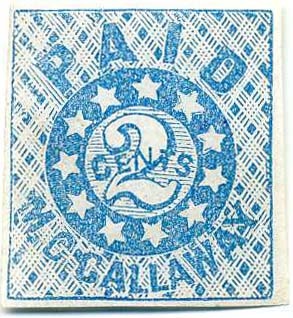 2¢ blue #56X1a (MEM-TN-A01a) CRACKED PLATE, position 17, unused, no gum, 2006 CSA Certificate, CCV $500. $250. Memphis,Tenn. 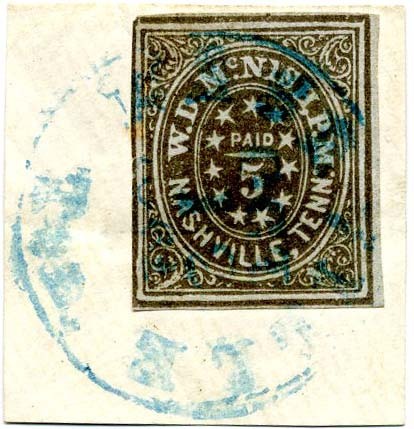 2¢ blue #56X1 (MEM-TN-A01), unused, no gum, fresh, Very Fine, CCV $150. $150. New Orleans, La. 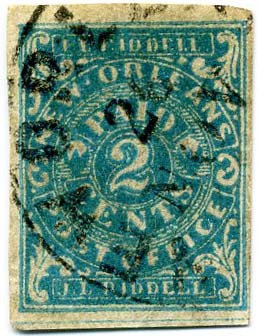 2¢ blue #62X1, original gum, heavy hinge remnants, small thins, Very Fine appearance, SCV $225. $130. New Orleans, La. 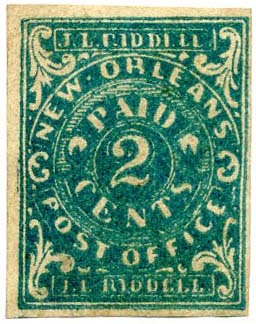 2¢ blue #62X1, used with bold straightline PAID cancel, guidelines at top, horizontal crease, SCV $550. $250. New Orleans, La. 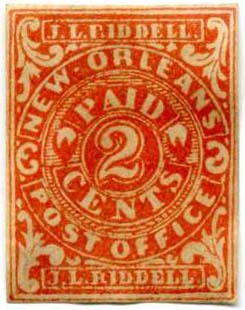 2¢ red #62X2, scarce used single, faulty but attractive spacefiller, 2009 CSA Certificate, SCV $1,000. $150. New Orleans, La. 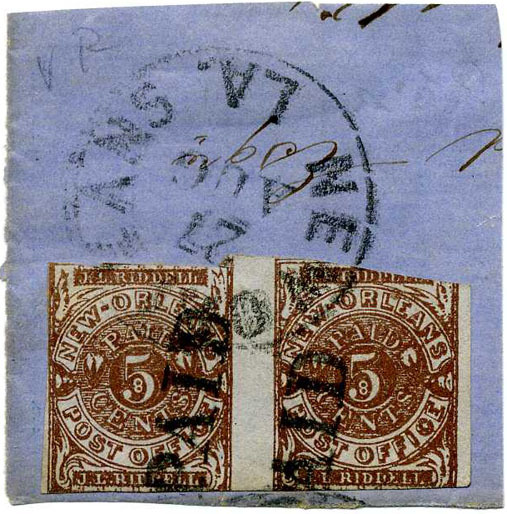 5¢ red brown #62X4, used with neat town postmark, deep rich color, Very Fine, 2014 SCV $200. $200. New Orleans, La. 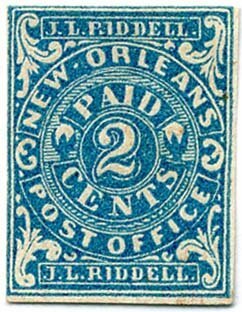 2¢ blue #62X1, unused, no gum, slightest edge thinning at top, 2014 SCV $225. $200. New Orleans, La. 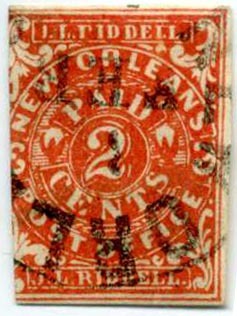 2¢ red #62X2, unused, no gum, 2014 SCV $190. $210. 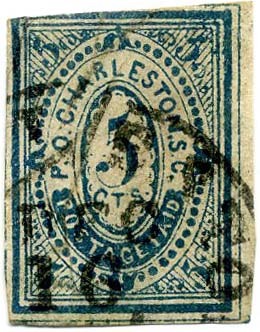 Charleston S.C., 5¢ Blue #16X1, Type H, large margin with all four outer frame lines complete, deep rich color, bold strike of Oct. 19  cds, small thin spots at top and right, slightly toned, Extremely Fine Gem appearance, scarce with such wide margins, Very few of the Charleston provisionals extant are sound, 2014 SCV $ 850. $650. 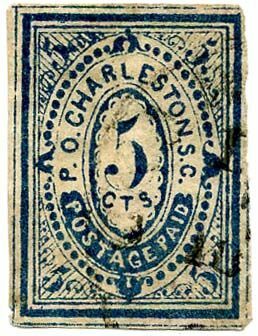 Charleston S.C., 5¢ Blue #16X1, Type F, large margins showing three complete outer frame lines and half at right, light strike of circular datestamp, few toned spots, tear at right, otherwise Very Fine, Very few of the Charleston provisionals extant are sound, 2014 SCV $ 850. $600. 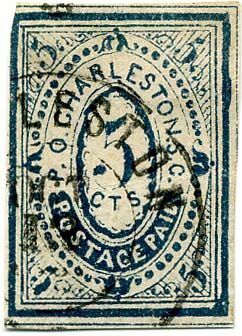 Charleston S.C., 5¢ Blue #16X1, Type P, large margins showing 2 1/2 outer frame lines, just in at upper left, rich color, neat Oct. 13 cds, light horizontal crease at center, Very Fine appearance, Very few of the Charleston provisionals extant are sound, 2014 SCV $ 850. $600. 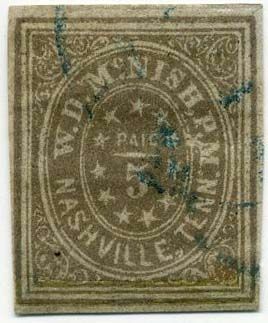 Nashville, Tenn. 5¢ gray #61X4, used with blue town cancel, large to ample margins all around but repaired with bottom 2 ½ mm of stamp replaced, Very Fine appearance. SCV $1,500. $600. 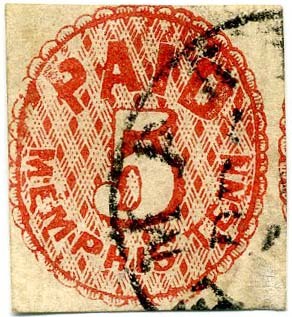 Memphis, Tenn. 5¢ red #56X2 used with town postmark on part of piece, small thin. SCV $250. $125. 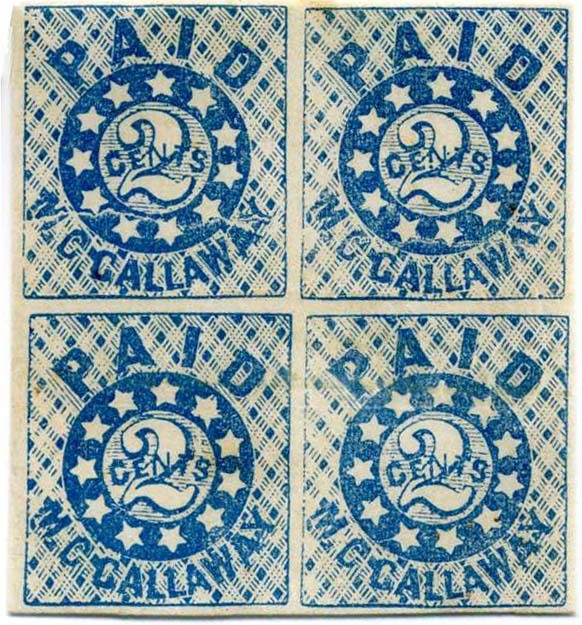 Memphis, Tenn. 2¢ blue block of four #56X1a (CSA Catalog MEM-TN-A01-Ab) showing the partial printing caused the cracking off of the printing plate, usual faint creasing, Scarce, showy and popular, CCV for a single partial printing is $500 thus cumulative $1,300 CCV without regard to premium for the block. $850. 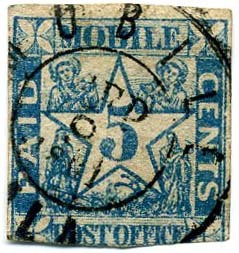 Memphis, Tenn. 2¢ dark blue #56X1, part original gum, usual creases, fresh, pretty dark shade. SCV $100, CCV $150. $100. 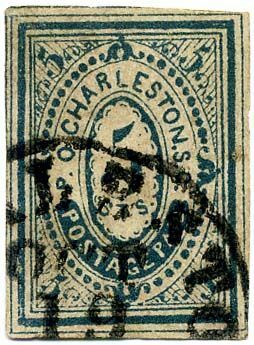 Charleston, S.C. 5¢ blue #16X1 used with neat town cancel, faulty (as are most all) with repaired defects, SCV $850. $300. 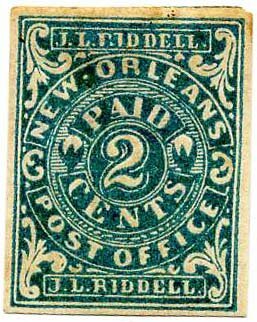 Memphis, Tenn. 5¢ blue pair #56X1, positions 47-48, unused, no gum, tiny edge nicks, faint pressed horizontal crease, SCV $200 as singles. $150. 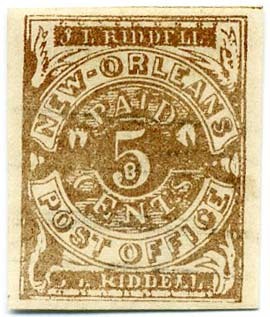 New Orleans, La., 5¢ yellow brown #62X5 with great margins, no gum, Very Fine. $200. New Orleans, La. 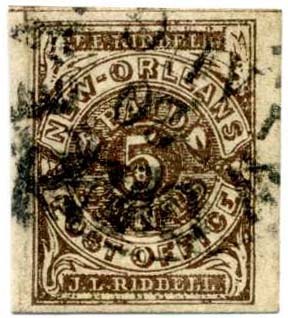 5¢ brown on bluish #62X4 imprint single with “New Orlean” at bottom, position 37 with huge margins including significant part of position 29 stamp above, almost a stamp and a half. 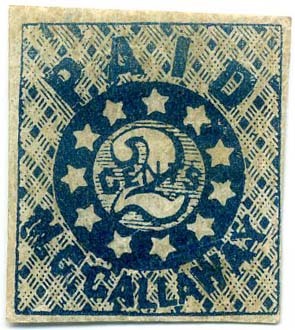 Used with neat bold strike of PD 5 CTS. / N.O.P.O. 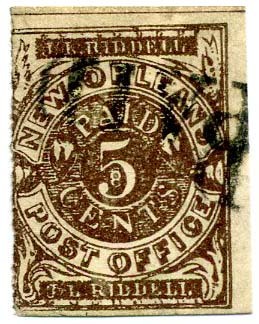 which was used on handstamped provisional envelopes applied dockside. Very minor creases and tiny thins but Extremely Fine appearance. Scarce and flashy. $1,100. New Orleans, La. 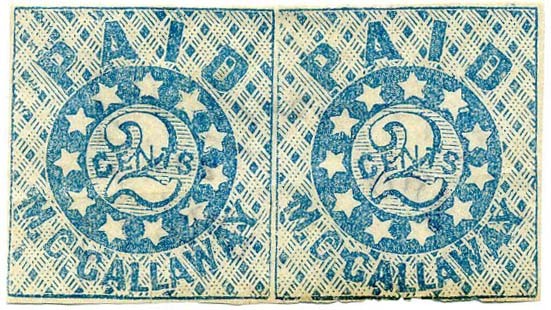 5¢ brown on bluish #62X4 imprint pair, positions 35-36 used with perfectly struck town cancel, a Beauty! $600. New Orleans, La. 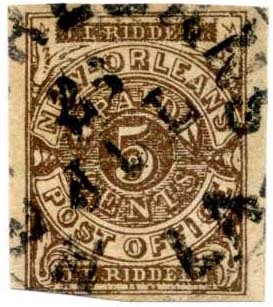 5¢ brown on bluish #62X4, positions 6-7 with part imprint at top, used with two PAID cancels. $500. New Orleans, La. 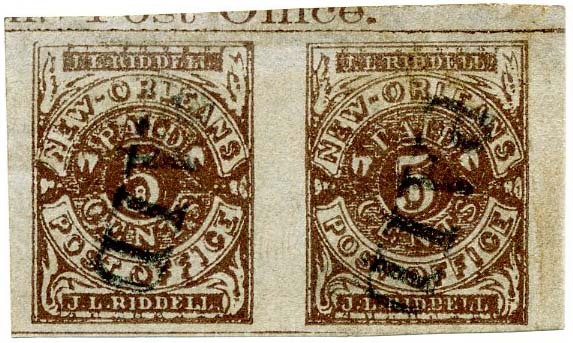 5¢ brown on bluish #62X4 with large side margins, tied on piece with bold strike of PD 5 CTS. / N.O.P.O. 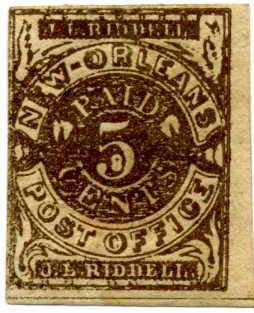 which was used on handstamped provisional envelopes applied dockside. $600. New Orleans, La. 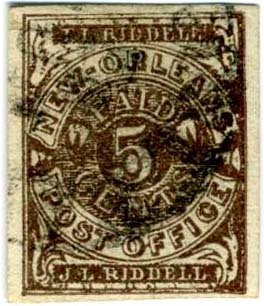 5¢ brown on bluish #62X4, position 39 with part imprint at bottom, huge margins including part stamp at left, Very Fine $300. New Orleans, La. 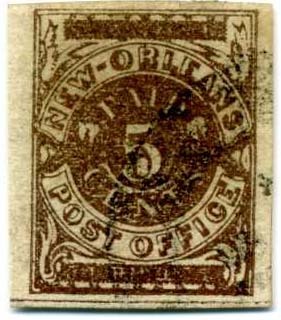 5¢ brown on bluish #62X4, positions 37-38 with part imprint “New Orleans Post O” at bottom, original gum, gum creasing, small hinge remnant. Showy. $550. 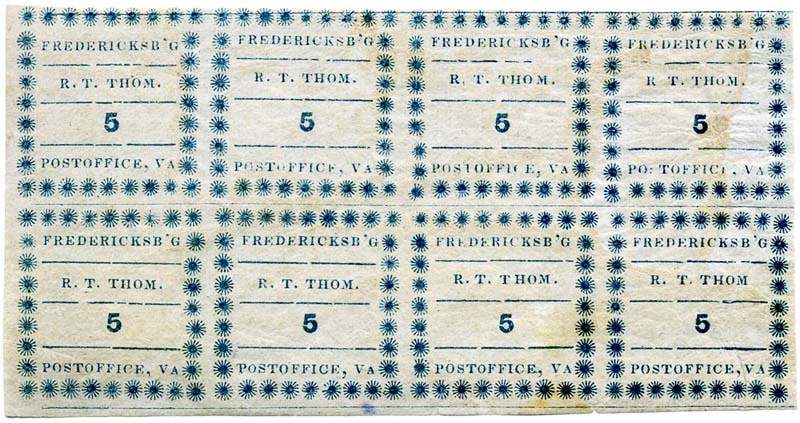 Fredericksburg, Va. 5¢ blue on bluish #26X1 block of 8, Positions 1-4 / 6-9, original gum (seldom seen), large to huge margins, usual slight creasing as normally seen on this very fragile paper, tiniest tear at bottom. GORGEOUS RARE MULTIPLE. Ex Wickersham, Hall and Powell. SCV as two blocks of 4 $8,000. 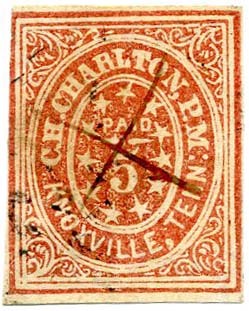 Knoxville Tenn. 5¢ brick red on grayish laid paper #47X1, plated by prior owner as position 5, bright color, light strike of town cancel and manuscript "X", tiny natural paper wrinkle at top left not mentioned on accompanying 1983 PF certificate. $1,100. 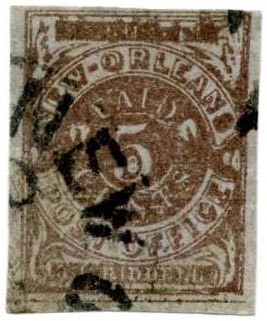 Nashville, Tenn. 5¢ brick red #61X2, position 6, with blue town postmark, thin spot, magenta manuscript on verso shows through slightly to face but melds well into the color of the stamp. SCV $1,000. $550. 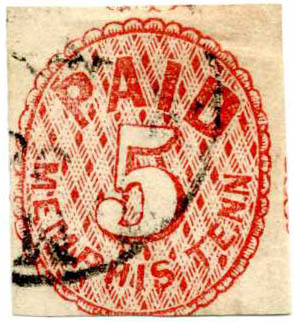 Memphis, Tenn. 5¢ red #56X2, used with town cancel, slight soiling, SCV $250. $150. New Orleans, La. 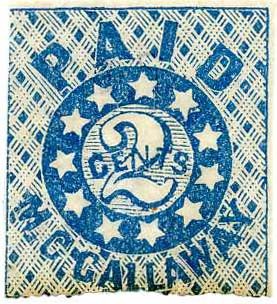 2¢ blue #62X1, unused, no gum, Fine-Very Fine. SCV $225. $180. New Orleans, La. 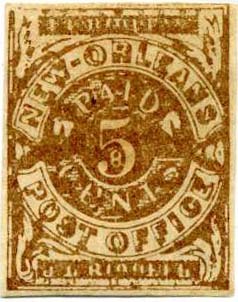 5¢ yellow brown #62X5, unused, no gum, nice large even margins, Very Fine, $150. New Orleans, La. 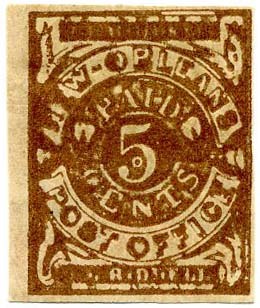 5¢ brown #62X3, used, neat town postmark, clipped at upper left, SCV $200. $100. New Orleans, La. 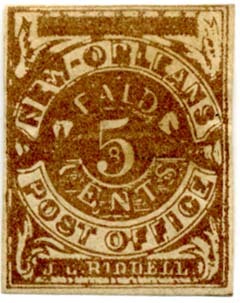 5¢ yellow brown #62X5, unused, 80% OG, Fine, SCV $160. $100. New Orleans, La. 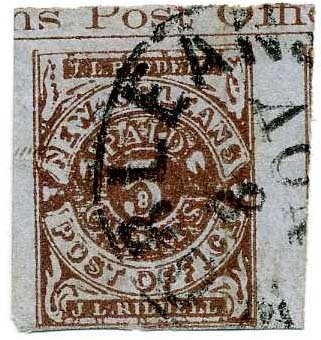 5¢ yellow brown #62X5, unused, no gum, Very Fine, SCV $160. $150. 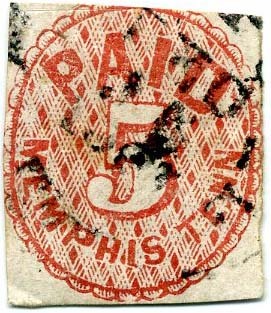 Memphis, Tenn. 5¢ red #56X2, used with town cancel, slight soiling, SCV $250. $200. 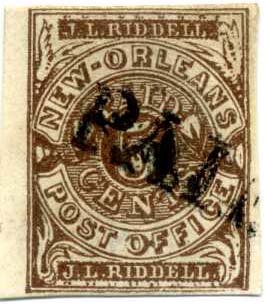 New Orleans, La, 5¢ brown #62X3 used with PAID straightline cancel, fresh, rich color, horizontal crease, SCV $200. $100. 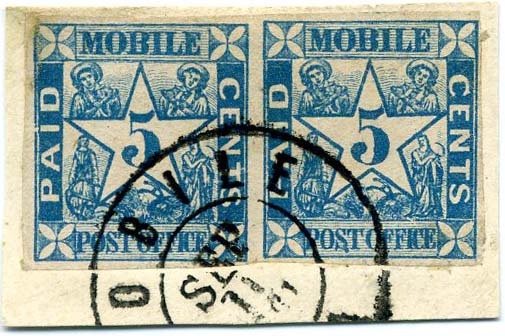 Mobile, Ala, 5¢ blue #58X2 used with town double circle datestamp, tiny faults, SCV $450. $170. 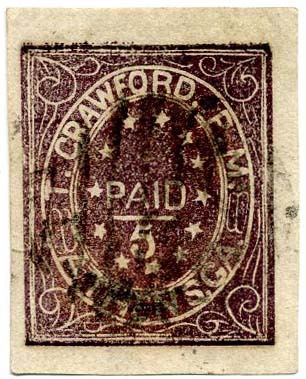 Athens, Ga, 5¢ purple #5X1, huge margins all around, rich color, usual grid cancel, slight thin top right margin, Extremely Fine appearance, SCV $1,750, Ex Huys. Old BPA and APEX certificates from when still on cover. $1,600. 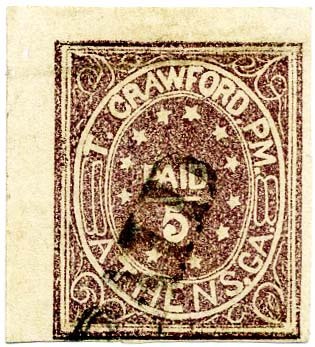 Athens, Ga, 5¢ purple #5X1, type I, upper left sheet margin single used with straightline PAID cancel, small shallow thin and tiniest edge tear at top, Very Fine appearance. SCV $1,750. $850. 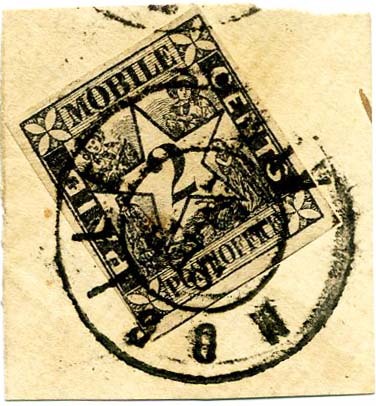 Mobile Ala., 2¢ black #58X1, full to large margins three sides, close at lower left, tied by Mobile Ala. double-circle datestamp on small piece, Very Fine, ex Wishnietsky and Wall, signed Costales. SCV $1,200. $1,000. 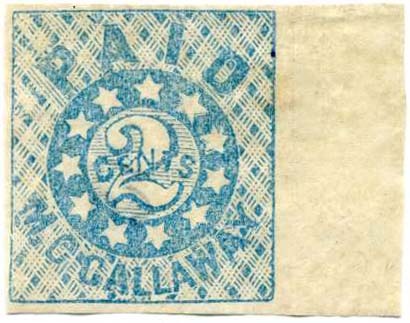 Mobile Ala., 5¢ blue #58X2, pair, with large margins except where just in at top left corner, tied by MOBILE / ALA. // SEP / 11 / 1861, double-circle datestamp on small piece, small flaw at top left corner otherwise Fine-Very Fine, ex Powell. SCV $1,050. $750. 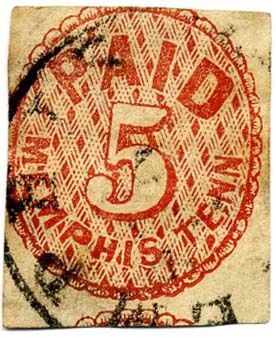 Nashville Tenn., 5¢ gray #61X4, position 5, tied by blue NASHVILLE cds on piece of pink-lined envelope, tiny toned spot at left, Fine, the TRUE GRAY SHADE IS VERY SCARCE, ex Powell. SCV $1,500. $1,200.